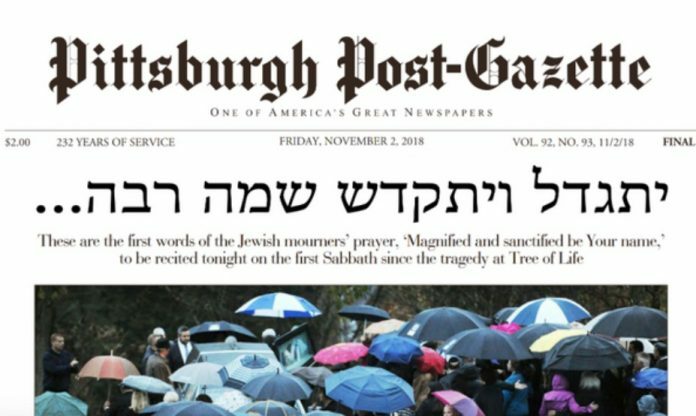 The Pittsburgh Post-Gazette put the opening words of the Kaddish on the front page of its newspaper on Friday to honor the victims of the synagogue shooting. “Yisgadal V’Yiskadash Shmei Rabbah,” the headline reads in Hebrew. Friday evening marks the first Shabbas services since a gunman opened fire inside the Tree of Life synagogue in Pittsburgh’s Squirrel Hill neighborhood last weekend, killing 11 people and injuring several others. רבא should be with an א, but a nice tribute nonetheless.